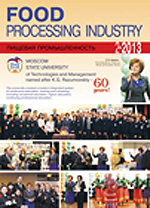 Limited company Publishing house Food processing industry is the specialized publishing house that nowadays is publishing ten magazines about different branches of food processing industry: "Food processing industry", "Beer and beverages: alcohol-free and alcoholic, juices, wine", "Baking in Russia", "Storage and processing of farm products", "Winemaking and Viticulture", "Confectionary manufacture". Magazines widely cover the field of actual questions of multiprofile foodstuff sector of agrarian and industrial complex: economics and organization of manufacture, engineering and technology, raw materials and additives, control and quality, technical regulation, packaging and logistics, advanced experience, expositions, conferences, seminars etc. Every year hundreds of clauses are published in our editions, thousands of authors appears in print such as the most authoritative heads of branch, eminent scientists and experts, representatives of leading native and foreign companies. Editorial boards of magazines consist of far-famed in food processing industry, due respectable, competent people. Our magazines distributes by subscription in Russia, countries of Commonwealth of Independent States, Baltic States and aboard. They are also always presented on native and foreign expositions of foodstuff themes, conferences, deliberations and other arrangements. Publishing house publishing no cyclic printed outputs: books, brochures, booklets, advert leaflets, calendars etc. Publishing house "Food processing industry" and its magazines are members of row of branch unions: Association of branch unions of agrarian and industrial complex, Union of commodity producers of foodstuff and food processing industry, Russian union of flour-grinding and groats enterprises, Association of producers of soap and butter-oil production, Association of enterprises of confectionary industry, Union of ice-cream vendors of Russia, Union of participators of alcohol market, Union of producers of foodstuff ingredients. General Director and Editor-in-Chief of Publishing House "Food Industry" - Candidate of Technical Sciences, Honored Worker of the Food Industry of the Russian Federation, Member of the Union of Journalists of Russia Olga Petrovna PRESNIAKOVA.